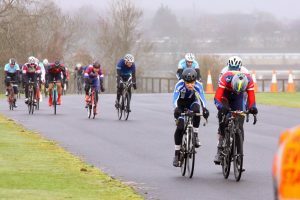 Illi Gardner (Veloflow), Ed Gray (Uni of Bath) and Sean Townsend (VC Equipe/FlixOralHygiene/Propulse) all followed up wins in their previous Winter Series outings with commanding wins in Round Eight. The gusting wind was blowing strongly from the South West and this affected the racing on the twists and turns of Odd Down, with the racing becoming highly tactical in all three races. 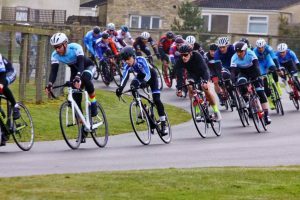 Townsend had taken advantage of hesitation in the bunch to escape solo last week, but this week the main breakaway came early on, with Rob Hardyman (Forever Pedalling) forging 24 seconds ahead on his own. The bunch was always active, despite the breakaway establishing such a large lead, with the main favourites using the crosswind up the finish straight to put the whole field into the gutter. 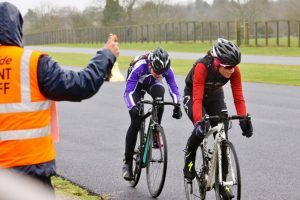 In the end, this pressure took its toll, with Townsend following up a surge from series leader Charlie Revell (Team Tor 2000 Kalas) to split the field into three groups with an effort that took a full two laps to pry open the gaps. It was Townsend and Revell, along with Andrew Edwards (Bristol RC) and the diminutive Morgan Curle (Giant Halo) who made the front group, with Andrew White (Okehampton CC), John Russell (Bristol RC) and Adrian Reynolds (Somerset RC) trying to get across to the leaders as the bunch swung across the road, unable to hold the wheels. The chasing group got some support as Jared Linden (Royal Dean Forest CC), Tim Southcombe (Somerset RC) and Colin Smith (Army Cycling Union) bridged as well as Edwards who dropped back from the front to support second-overall Russell. However, this support was not enough and even as more riders came across to join them, it was the group ahead that had begun building a lead. Hardyman was still up the road at this point, and he immediately sat up to tuck in with Revell, Townsend and Curle. As the finish approached, those who had missed out on the split started to make a last desperate charge into the wind to get across. First White and then Edwards burst away to try and rescue a high placing as the bunch ran out of firepower. 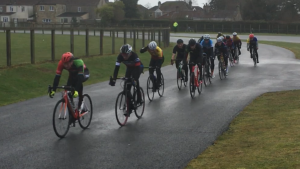 However, chasing four leaders was always going to be a tall order, and the spoils went to the front group, with Townsend taking the win by a clear margin from Hardyman who held on from his early escape to pip Revell by a wheel length. Curle had been towered over by the bigger riders throughout the escape and was not surprised to be outmuscled in the finale. Edwards and White held their positions in the gap between the groups and it was Southcombe who took the bunch kick ahead of Rob Borek (Forever Pedalling). Revell’s presence in the winning move means that he pads out his advantage in the overall standings ahead of Russell to 37 points, with 100 remaining to be won. If Revell wins at Round 9 then Russell must finish on the podium or he will be unable to deny the Team Tor 2000 Kalas rider the overall victory at the final round. Hardyman was also a main beneficiary, climbing above White and into third place overall. Townsend has also climbed into the top 10 overall with his two wins in the last two rounds. The women’s race has been brutally aggressive throughout the series, with the riders exploiting any opportunity to split the group. And with the wind howling, this race saw the toughest of the conditions, there was the potential for the same to happen this week. The racers were certainly up for it, once Meg Dickerson (Forever Pedalling) had launched the first dig early on, not a lap went by that one of the group tried to split the race. The jumps typically came as the group passed the finish line, where there was a cross-headwind or with the cross-tailwind on the back straight. However, with the circuit turning into a headwind following these straights, attackers were immediately punished and reeled in at short order by the rest of the group. Gardner has been at the very front of the races in the past four rounds, only being denied by Liv-Halo’s Lucy Gadd in Round 6. And with series leader Lauren Johnston (Avid Sport) not racing this week, this pair were the riders to watch. Neither of them was giving the other any room, and when Gardner put the rest of the race in the gutter midway though the race, Gadd did not hesitate in covering the move along with Dickerson and Molly Hodges (Avid Sport). 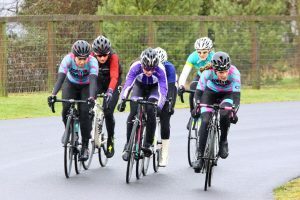 With the front four all wary of their rivals, none would contribute to keeping this group clear, and this was the opportunity Lucy Driver (Forever Pedalling) and Emily Slavin (IRIS Race Team) needed to work their way back to the front of the race. Perhaps this was Gardner’s opportunity to test the water, as with one lap to go she put the same move in again with no intention of slowing down this time. Gadd was the only rider able to respond to this move at first, but Dickerson dug in and got across, to make it a leading group of three. She tried to carry her momentum from the catch to immediately go clear of the other two, but the leading pair were alert to her attack. Last time they raced together, Gadd got the better of Gardner at the finish, but Gardner’s jump was too powerful this time. She hugged the far right of the finish straight to provide no shelter for her rival and took another win to make it three wins from four races. With the top three overall not racing, this was Gardner’s opportunity to move up into joint second overall with Uni of Bristol’s Rebekah Nash. Gadd and Dickerson climb into the top ten overall whilst Hodges and Slavin closed in on fourth place overall. The men’s 4th cat race started in cagey fashion, with the riders looking to avoid working in the wind. Chris Downham (Bristol RC) made the first move, pursued by Mark Hardyman (VC Walcot), but the pair were brought back before Ed Gray made a move. This was a surprise, as Gray had won at round 5 by playing a patient and tactical game, instead of showing his hand early as he was doing now. 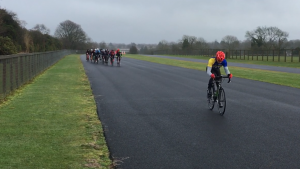 Despite the challenging conditions for soloists, Gray persevered, holding a steady gap of 14 seconds ahead of the group for the middle phase of the race. It was an escape by Theo Brumhead (Bristol South CC) that triggered the peloton into life and brought Gray back into the fold as the race approached the final few laps. As the catch was made, Downham and Hardyman again tried to get clear by putting the pressure on into the crosswind on the finish straight and Nicholas Barks was the next to try this one lap later. However, this close to the finish, the bunch were not going to miss the opportunity for a sprint. 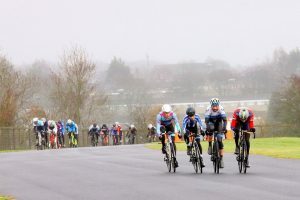 As the riders scrambled for shelter up the finish straight, Hardyman found himself sandwiched in the sprint and came down along with Ben Keenan (Veloton). Fortunately, both riders were able to pick themselves up and cross the finish line on foot. This all happened well behind Gray, who had again shown his powerful move late in the race to finish well clear of the rest of the group. David Cullen (Bristol South CC) was also well clear of the crash, coming in second ahead of Daniel Riggs (Corsley CC). His win takes Gray into an impressive 8th place in the overall standings, the highest placed 4th cat in the series. Thanks to Jon Curle for the photos.